This cake is so good that its always the first thing to disappear, growing up you literally needed to be early to claim a piece or you’d miss out on this delicious slice of heaven. 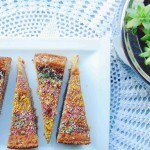 Let me share this recipe with you so you too can enjoy a delicious slice of this tropical cake. 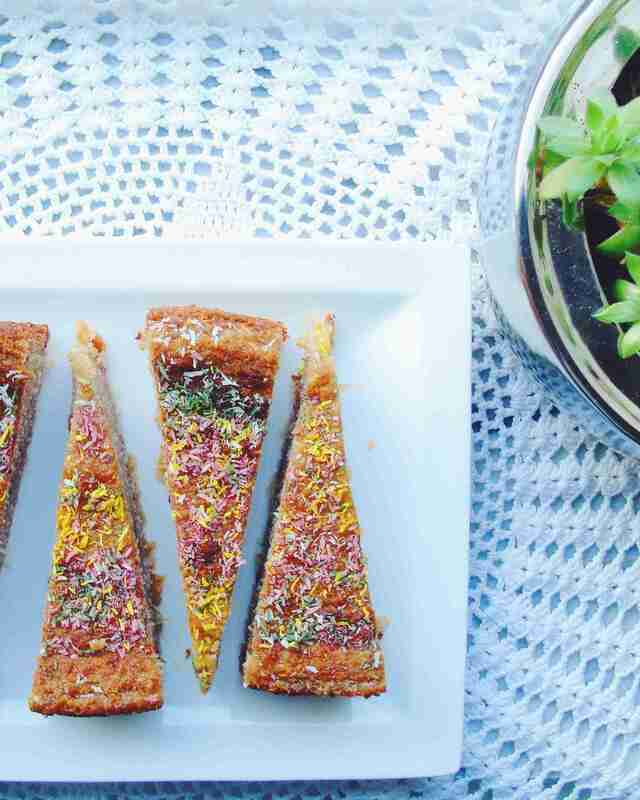 The main ingredient in this cake is grated cassava, here in the Netherlands you can easily find this frozen in at asian grocery stores or toko. 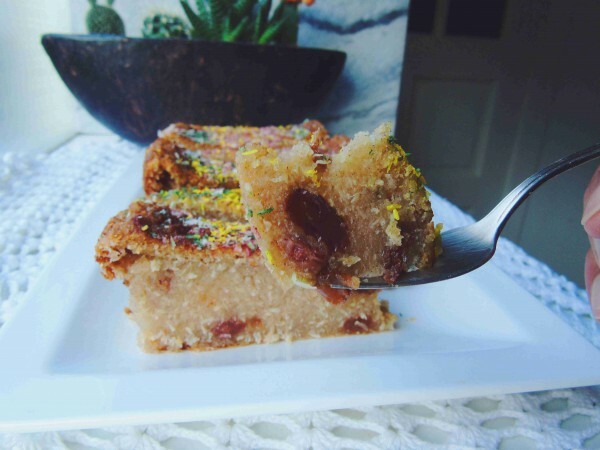 The great thing about the cassava is that you do not need to use any flour, making this cake gluten free and giving it a delicious sticky texture. 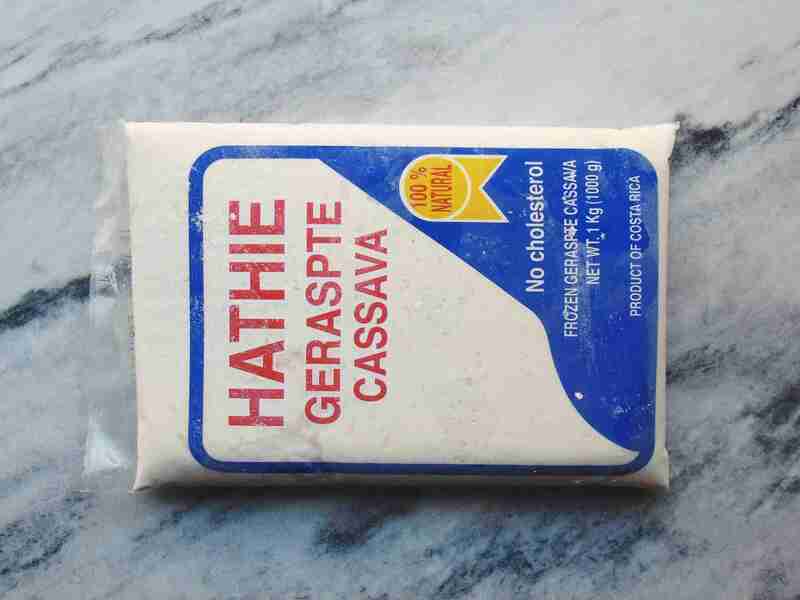 If you can’t get your hands on frozen grated cassava just grate it yourself. If you are using the frozen cassava remember to remove the cassava from the freezer a couple of hours before you’re planning to bake the cake. 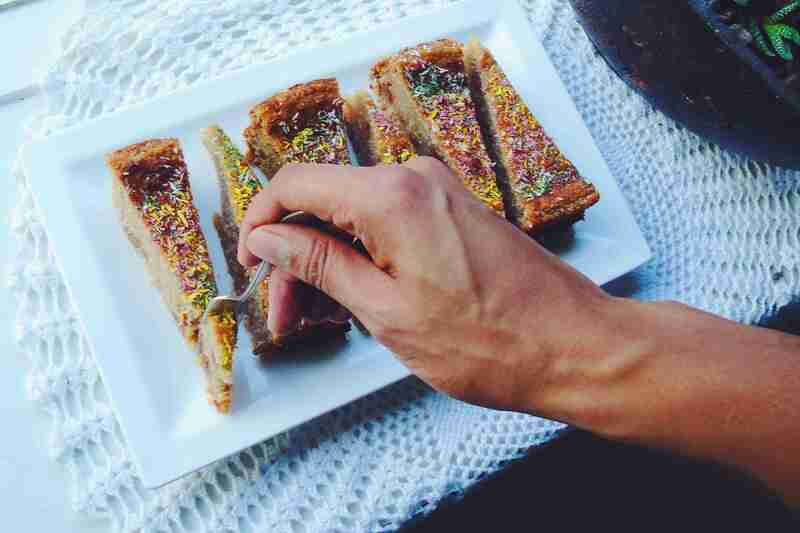 Normally people use sprinkles to top the cake, but since I couldn’t find vegan sprinkles (the fact that some companies still use crushed bugs to colour their food is beyond me) I made some myself using coconut and natural food colourings. I just took some grated coconut and mixed it with the colourful powders to create my own cruelty free and basically superfood sprinkles. Of course feel free to use other powders or methods to make your sprinkles. Now all thats left to do is make your own! 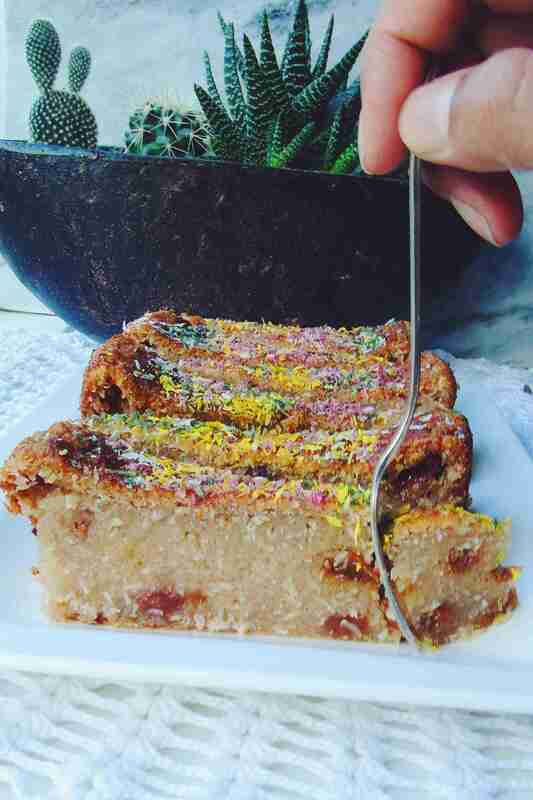 Trust me this is one of the easiest cakes you’ll ever bake. 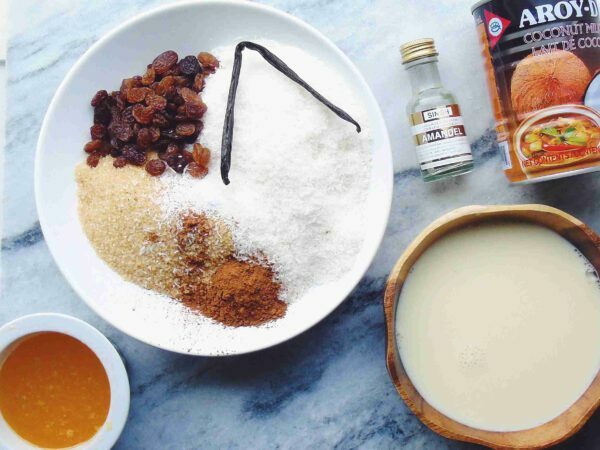 If you decide to make this cake let snap a pic and share it with me on instagram. I’d love too see how you recreated this all time favourite of mine. 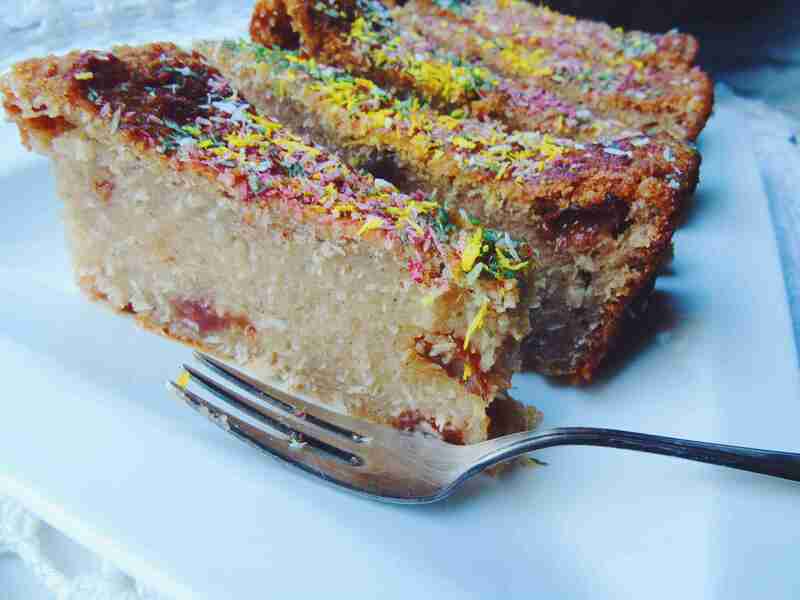 Tropical Cake thats easy to bake and super delicious. Preheat oven to 175 degrees Celcius or 347 Farenheit. Mix everything together and place in greased baking dish, or line with parchment paper. Place the cake in the oven for about 2 hours or until u poke it with a fork or skewer and it comes out fairly clean. It doesn't matter if its a little bit sticky as this cake has to be very moist and a bit sticky. Just make sure the top wont burn if you can always cover it with aluminum foil at the end to prevent burning. Once you've removed the cake from the oven let it cool completely before cutting.